Staff Sgt. Melishia Francis prepares her breast pump in a lactation room at Lackland Air Force Base's Wilford Hall Medical Hospital. Carson Frame reports on the breastfeeding challenges that military moms often face. 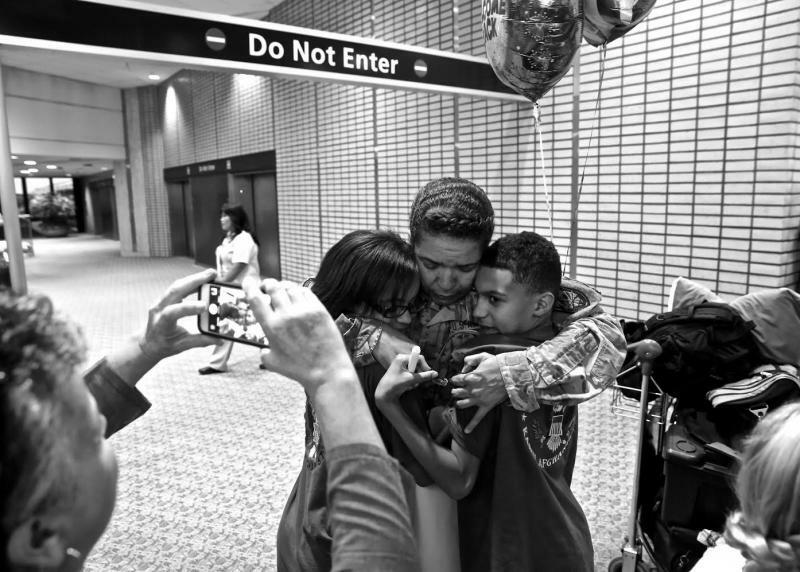 Jesseka King returned to San Antonio's Lackland Air Force Base last year after giving birth to a baby girl. She took advantage of a recent Pentagon policy change that gave her 12 weeks of maternity leave, during which she established a steady breastfeeding routine. King, a basic training instructor, wanted to continue nursing after she came back to duty. She was aware that many military moms wean early, as the demands of their jobs prove too hard to balance with the logistics of breast pumping. 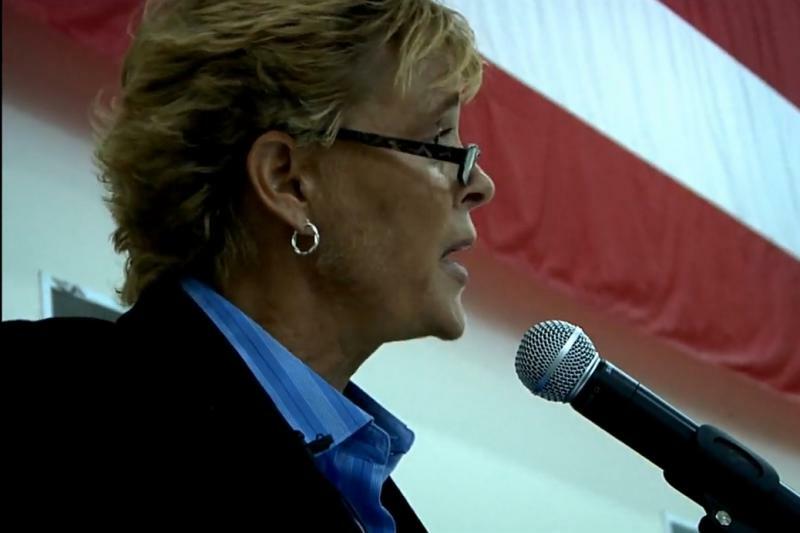 "I was determined for me to not become a basic military training statistic," King said. "Because so many moms - friend moms that I have - stopped breastfeeding maybe a few months off of maternity leave. It was just too much for them." During the workday, King's leadership gave her leeway to find and use empty rooms to pump. But King spent most of her days outside, guiding new recruits through drills. So she needed to improvise. "I was using our trainee holdover rooms. That's where we put sick trainees when they're quarantined from their flight," King said. "So it's not the most hygienic room." Another new mom at Lackland, Ronneisha Sargent, had similar issues. Her job required her to move to different areas on base, and even when she was near a room that could be used for nursing, it often was occupied. So her car became the go-to spot. "I know my car will always be there," Sargent said. "I only have 30 minutes. I don't have 15 minutes to find and knock and wait my turn." Such problems are common across the armed forces, said Navy veteran Robyn Roche-Paull, who founded Breastfeeding in Combat Boots, a nonprofit group that provides information to nursing moms in uniform. She said that each military branch has its own breastfeeding policies, and they're too open to interpretation. 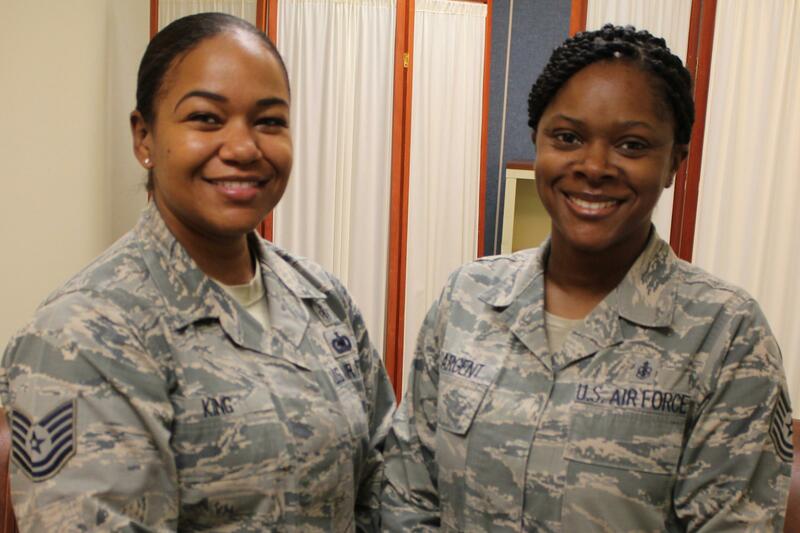 Air Force Tech Sergeants Jesseka King (left) and Ronneisha Sargent each experienced challenges nursing their children while on duty at Lackland Air Force Base. "Some regulations are very specific and say, 'Every two to three hours for 15-30 minutes, that's what your break is,'" Roche-Paull said. "Where other ones will say, 'every three to four hours for 15 minutes.'" In the absence of clear policy and policy enforcement, it's up to commanders and supervisors to accommodate female service members as they see fit. A 2015 study in Military Medicine found only about 30 percent of women across the services met their goals for breastfeeding duration - and 14 percent of those blamed a lack of support. Roche-Paull said she would like to see the military offer more training about breastfeeding. "Ten or 15 minutes about 'You might have a coworker that just came back from convalescent leave and she needs to pump," Roche-Paull said, "and here's what the regulation for your branch says." Along with two other moms in their unit, Sargent and King lobbied their commander for a permanent lactation room. With multiple women breastfeeding at the same time, the commander made it happen. 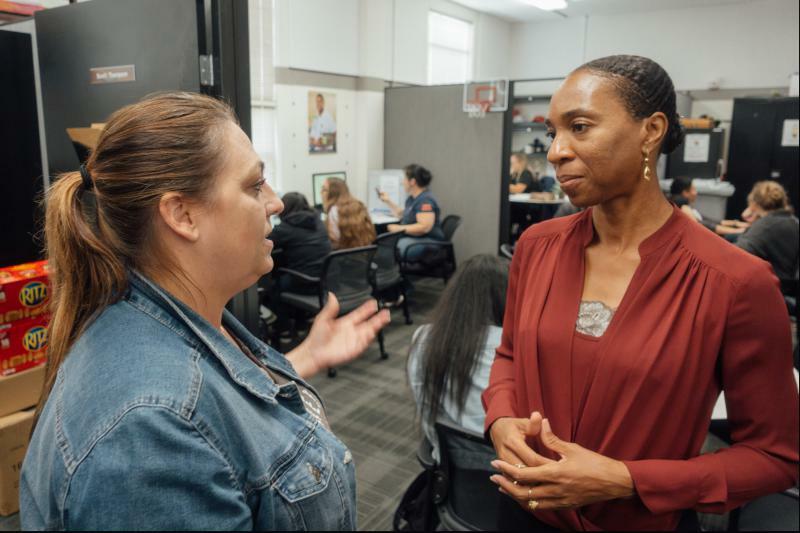 A growing number of military facilities are making similar changes as the need for breastfeeding accommodations becomes more widely acknowledged. Maj. Crystal Karahan, an Air Force medical officer, demonstrates the correct posture for nursing a child in the lactation room at Wilford Hall Ambulatory Surgery Center. 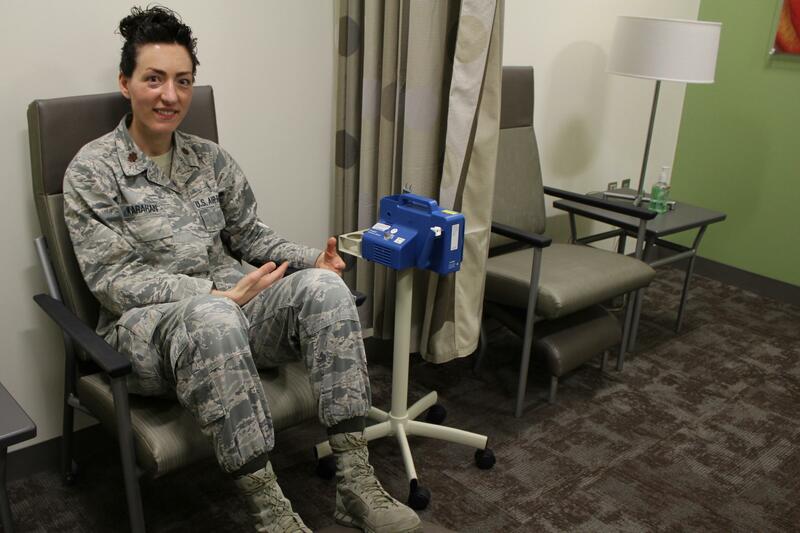 In another area of Lackland, a well-stocked lactation room at the military hospital Wilford Hall has electrical outlets, privacy, a sink, and hospital grade breast pumps. "There are side tables, lamps, many of the normal accommodations you would see in your home for comfort purposes," said Maj. Crystal Karahan, a medical officer who helps women on the base understand the breastfeeding resources available to them. "You need to be relaxed and hydrated to pump effectively. It should not be a rigid or sterile environment." In addition to dedicated lactation rooms and longer maternity leave, the Air Force also approved a shirt that makes it easier for women to nurse and pump in different environments. Tricare, the military's health plan, began paying for breast pumps and supplies in 2014. Still, Karahan notes that there's little data on whether those policies are actually encouraging breastfeeding. Last year, the American Academy of Nursing called on the Defense Department to start tracking how long new mothers in the military breastfeed their children. "It's easy to just blanket statement and say we're doing enough," she said. "But if we're not measuring it, we'll never know if it was enough," Karahan said. The Marine Corps photo scandal has disappointed some veterans who helped break down barriers for women in the military, but they say it shouldn't overshadow the progress of female service members. The Pentagon doesn't track how many deployed service members are mothers (or fathers). But being a parent while serving the country creates unique challenges.